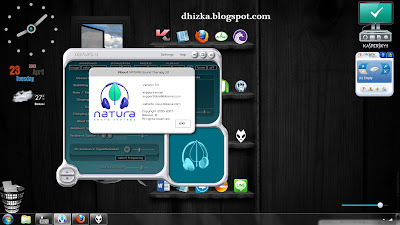 Natura Sound Theraphy 3.0 bisa kita gunakan untuk mendengarkan suara-suara natural yang enak dan nyaman didengar. Misalnya seperti suara hujan, ombak, serangga atau suara burung. Your paradise of blissful relaxation is just one app away! The original and ever popular Natura Sound Therapy is now mobile, just like you! World class athletes know what “being in the zone” is all about. Now, so can you. When ever and where ever you choose. With Natura Sound Therapy you can…. Immediately start to relax with 34 original and amazing Nature and Music Sounds. These expertly recorded, high fidelity, seamless sounds include: Ocean Waves, Babbling Brook, Rain/Thunder Storm, Singing Birds, Insects, Chirping Frogs, Wind Chimes and Ambient Space 1 & 2. Entrain your brain utilizing 64 pure digital master Brainwave Synchronizer Tones that encompass the realm of Beta, Alpha, Theta, and Delta waves. Quickly accelerate your training and focus by using the 38 easy Quick Start Factory Presets that include the popular: Wide Awake, Energy Boost, Peak Awareness, Brain Refresher, Supreme Concentration, Mental Stimulation, Pick Me Up, Creative Visualization 1 & 2, Deep Meditation 1-4, and Immune System Boost.